This report offers a general outline of the New York Bight area beaches. An understanding of the geologic history of the southern New England is essential to inferring the origin of materials found on modern beaches in the greater New York City area. In general, rocks of different geologic ages display unique characteristics representing the sedimentary, igneous, and metamorphic conditions that existed at the time of their origin. The amazing thing about the beaches in New York is that, in a sense, all of that geologic history is hidden there on the beach!!! 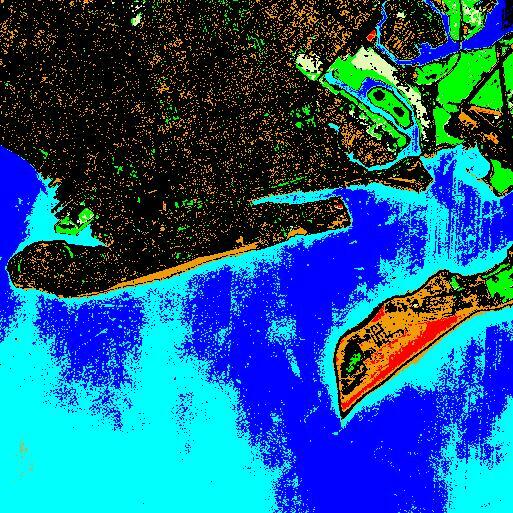 The figure below shows possible source areas of the sediments found on beaches around the New York Bight. Many complex processes transport and break down both natural and anthropogenic sediments, and ocean beaches play a significant role in the long-term fate of these materials. For more detailed information about the geologic history of the region check out the bibliography of this report. The coastal areas of the New York Bight are among of the most geologically active areas on earth. This might sound strange, but it is true (especially if you consider humans as geologic agents). Other critical factors affecting the dynamics of the area include the ongoing effects associated with the melting of the great ice sheets at the end of the last Pleistocene glacial advance (which ended as recently as about 10,000 years ago). The melting of ice has caused a great transgression of the sea. In addition, the removal of the weight of the ice (perhaps a mile or more in places) is causing the land to isostatically rise (in some areas more than others). This isostatic adjustment of the crust may be a trigger mechanism for many of the small earthquakes that have occurred in the region through time. An enhanced portion of a Landsat image (below) includes parts of Brooklyn and Queens. The scene illustrates many features typical of the coastal region of the New York Bight region. The image shows Rockaway Beach and Breezy Point (Queens, NY) on the lower right. The entrance to Jamaica Bay separated the eastern end of the Rockaway barrier island/spit from the urbanized southeastern portion of Long Island (mostly southeastern Brooklyn). The beaches of Coney Island (lower center) and Seagate (lower right) form a spit that projects eastward forming a protecting barrier to the lower Hudson River Harbor (lower right). The image has been enhanced to highlight certain features. Speckled Black - dense urban development. Green - lush plant growth, particularly undeveloped wetlands. At one time much of the northern portion of this area would have appeared "green." Orange - sand (beach) along the coast: barren lots elsewhere. Red - back beach (dry sand and shrubs: prime bird nesting area). Dark Blue - "clear" marine water. Light Blue - "turbid water" containing abundant algae and silt. "Plumes" extending landward from the open ocean (bottom of picture) probably represent tidal mixing currents. The HIGHLANDS REGION of New Jersey, New York and Connecticut. CATSKILL PLATEAU REGION of New York and eastern Pennsylvania. VALLEY AND RIDGE PROVINCE of western New Jersey and Pennsylvania. NEWARK BASIN and CONNECTICUT RIVER BASIN (Pennsylvania, New Jersey, New York, and Connecticut). ATLANTIC COASTAL PLAIN of New Jersey and New York (Long Island). The collection of web pages discusses the dynamic geologic processes that control the development of modern coastal landforms, and contains a collection of image libraries of area shore features and specimens of natural and anthropogenic materials from area beaches. Features of BEACHES AND BARRIERS in the New York Bight region. Image library of ROCK TYPES found in area beach gravel. Image library of SHORE FEATURESof the New York Bight region. Image libraries of "modern" SHELLS and other SEASHORE CREATURES that occur on area beaches. A discussion about the PALEONTOLOGY of area beaches with a library of images of selected fossils. 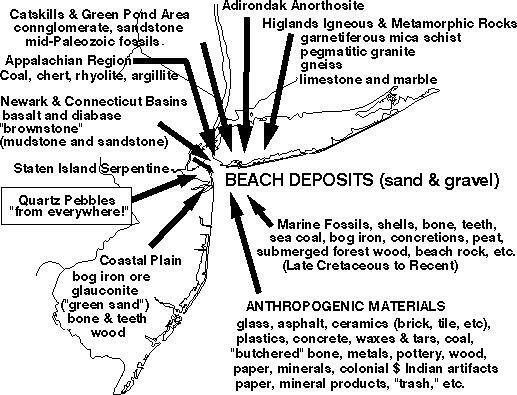 ANTHROPOGENIC MATERIALS on area beaches. The final web page is an INFORMATION GUIDE to further reading and research on the greater New York Bight region.